Award winning Elliott’s Foodservice/Cash & Carry. Elliott’s are delighted to have being awarded with The Stonehouse Gold Standard Award. This is a great achievement for Elliott's to have being selected by Stonehouse which is one of Irelands leading independent wholesale companies with a network of 24 member companies all family run businesses totalling 30 warehouses nationwide. 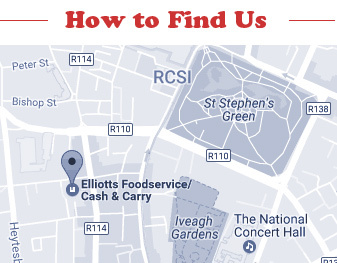 Elliott’s supply many of Dublin’s leading foodservice outlets ranging from Hospitals, Offices, Pubs, Clubs, Restuarants, Cafes and Schools. Our products range includes ambient, alcohol/tobacco, food and non-food products, chilled and frozen products to cater for all your needs. 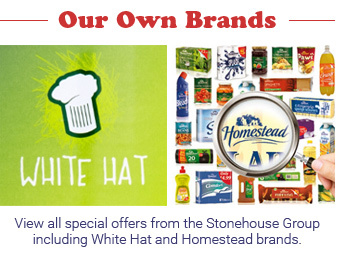 Our own brands include Homestead and White Hat. We pride ourselves on customer service, friendly staff, excellent value, great location and of course our prompt “Free Next Day” delivery service. Our fleet allows us to service our customers quickly, often the same day if required. As a family run and managed business we bring that personal touch to our customers and what we promise, we make sure we deliver on time.